The golden age of kung fu’s first star. 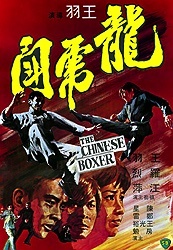 Shaw Brothers Studios’ first superstar, “Jimmy” Wang Yu, wrote, directed, and starred in The Chinese Boxer, released in 1970 (also known as The Hammer of God in the United States). The story begins when Diao, once thrown out of the school and the town by the local kung fu school’s master, and comes back for revenge after learning judo skills, intent to destroy those who dishonored him. One by one, he challenges and defeats the students at the school, until once again the master defeats him and runs him out. Not content at all with that outcome, Diao recruits Japanese karate mercenaries, and eventually samurai, to destroy the school and begin his own iron-fisted rule of the entire town, which begins with the establishment of a gambling den and leads to more nefarious activity. In one sense, the movie could have been much more interesting as a story following the downfall and subsequent obsession with revenge of Diao, but the world in 2016 may not be totally ready for it, let alone in 1970. Instead, we follow the path of our more traditional hero Lei Ming, played by Jimmy Wang Yu, as a student of the school that is the focus of Diao’s wrath, who fights against the criminal elements introduced into his hometown. 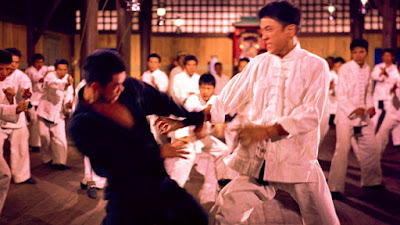 The movie is most renowned for being the first to use extensive unarmed, barehanded fighting; what we now are very familiar with as typical kung fu. 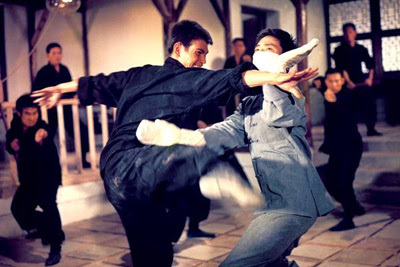 The fighting in the film, along with Yu’s star power, apparently revived new interest amongst Chinese youth in this style of fighting, which sort of makes this the Top Gun of kung fu movies. What Chinese youth and other movie fans saw in Yu was a dashing, charismatic figure in an exciting new format of action movie. It’s especially important to note the context of the film because it laid the proverbial foundation for so many of the tropes we find in modern martial arts movies. It’s not just the mere existence/invention/adaptation of the tropes that is so important, but that Yu does a remarkably competent job with all of them, such as the loner’s fight against an entire school, a dead master, the training montage, fighting in a restaurant, the battle of differing styles, and the distaste for the Japanese. Nothing hearkens back to an earlier time better than infighting and racial stereotypes, and the Japanese were often a convenient villain for Hong Kong-based studios like Shaw Brothers. The Japanese villains are at least appropriately badass here, led by another Shaw Brothers favorite in Lo Lieh. Lieh and his karate master henchmen are brought in by Diao to help him rid the town of Lei Ming’s school, because it just happens to be the main obstacle in building a gambling den and getting rich quick. Just to establish his badassness, Lieh chops a dinner table in half at a restaurant and then kicks through the roof tiles, just because he can. The fight scenes are mostly at “real” speed, without too much speed ramping and always with an emphasis on being entertaining. 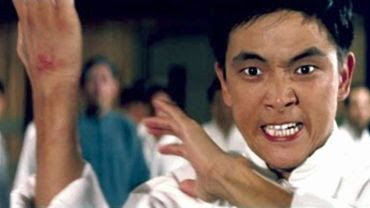 Yu is not the polished and smooth film fighter that Bruce Lee or Jet Li may be, but he knows where to put his camera so his audience isn’t confused and we don’t miss the emotional beats between the fighters. In addition to this, he also has a good eye for picturesque shots and action sequences, like a duel in the falling snow, or a chase through tall grass, or busy-ness of a crowded street. Older, campier kung-fu movies get mocked for cheesy film techniques, but I happen to like the quick zoom outs and the intense push-ins set to music; it keeps the energy up and hits me right in the Junesploitation sweet spot. With so many enemies to defeat, the blood pours often out of gashes, mouths, and eyeholes in the last third of the film. Lei Ming finally understands how to defeat his enemies by training himself to obtain unbelievable agility and making his hands harder than iron. The culminating battle is one taken straight from a Western wide shot, set on a deserted mountainside between Lei Ming and his two main adversaries. Yu, already a fixture in the Hong Kong film industry, cemented his reputation with this movie, but his popularity was unfortunately soon forgotten because of his breaking away from Shaw Brothers Studios and the rise in international prominence of Bruce Lee. Despite Yu’s popular decline, The Chinese Boxer still holds an importance place as a seminal moment in modern martial arts movie history. Doubt this will influence anyone to watch this movie or not, but I saw it for the first time during this years Junesploitation, and was very impressed. This is one of the definitive movies of the genre, in my opinion; Kung-Fu's Stagecoach, if you will. It's one of the reasons I love Junesploitation; we get to find and watch movies like this. The Chinese Boxer was so successful that Shaw Bros. basically made the same movie again with King Boxer, out later the same year. I saw King Boxer years before this one, and was pretty surprised when I realized they were different movies.